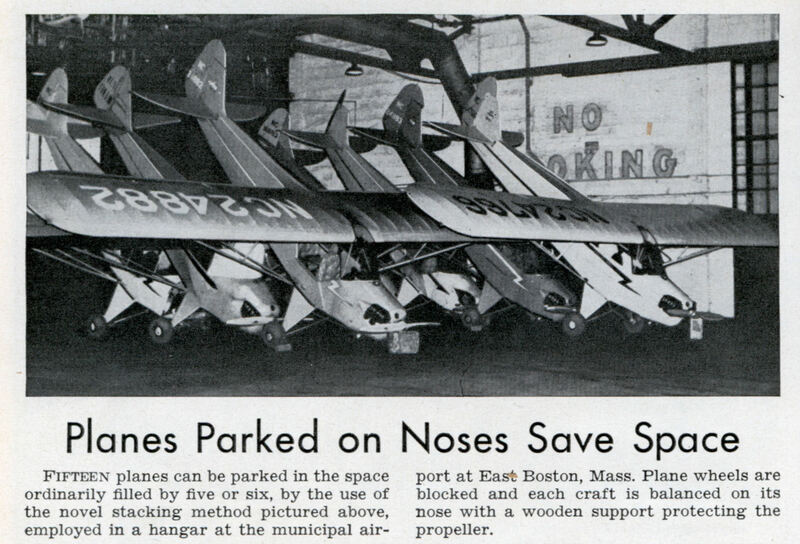 Fifteen planes can be parked in the space ordinarily filled by five or six, by the use of the novel stacking method pictured above, employed in a hangar at the municipal airport at East Boston, Mass. 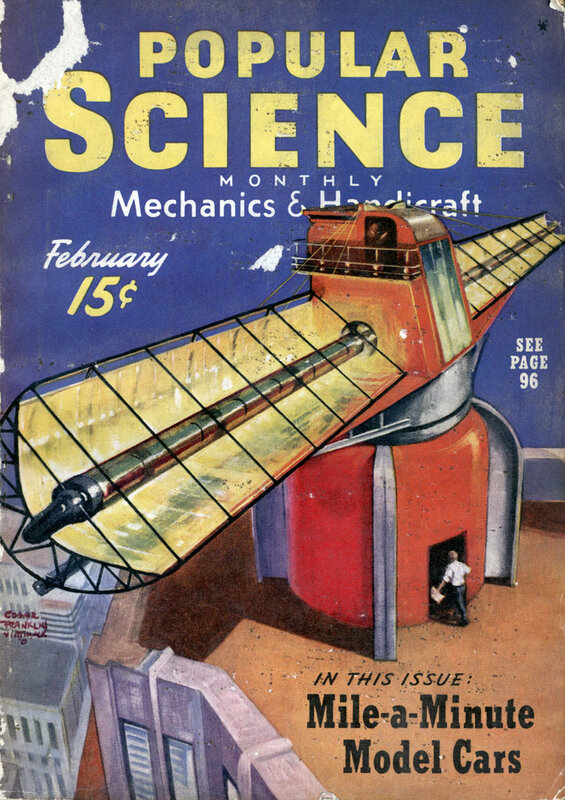 Plane wheels are blocked and each craft is balanced on its nose with a wooden support protecting the propeller. Looking at this the first thought I have is “I pity the poor engine…”. This is just a bad idea for the crankshaft thrust bearings not to mention the main bearings – the front main is taking a bit of a hit here. Let’s not even talk about the damage to the resilient motor mounts and the mounting sections themselves…which are not designed to take thrust in that direction. These are all Piper Cubs; there can’t be much weight involved–empty weight of an entire J-3 is 765 lb, and most of it is on the main gear anyway; note that the description says that they’re “balanced”; the fulcrum being the mains. How do you remove a plane from this mess without letting it fall onto another? What happens to the engine oil in this position? And I agree that putting weight on the crankshaft and engine mounts isn’t really a good idea. Don’t worry, there’s not much weight resting on those prop hubs. As for the oil, four out of those six planes (a J-2, a Taylor-Young, and a pair of early J-3s) have Continental A-40 Engines. A-40 powered planes need to have their tails held high during the pre-flight inspection to prime the oil pump, which is built right into the very front of the crankcase. FWIW, I fly an E-2 (VERY early Cub) and I’m restoring an early J-2, both of which have A-40s. I love the above comments for their technical insights. When I saw it I just thought of Cadillac Ranch. I’d like my plane now please, it’s the one at the back.